In a novel filled with his signatures -- nerve-shattering suspense, crackling dialogue, scathing wit -- Elmore Leonard proves once again why hesets the standard against which all other crime novels are measured. In "GetShorty," he takes a mobster to Hollywood, where the women are gorgeous, themen are corrupt, and making it big isn't all that different from making yourbones: you gotta know who to pitch, who to hit, and how to knock 'emdead. 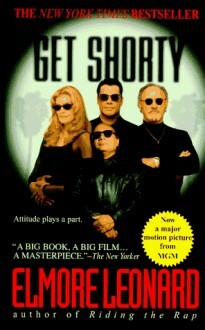 "Get Shorty" is now a major motion picture directed by Barry Sonnenfeldand starring John Travolta, Gene Hackman, René Russo and DannyDeVito. 8/5 - I had real trouble getting into the plot and unusual dialogue style and ended up giving up at page 95. I'm not sure if it was the book or my preoccupation with my recovery, so one day (hopefully this year) I'll give it another go. What a great book. I want to hang out with Chili Palmer. If you saw the movie and thought it was great (it was) the book is so, so much better.